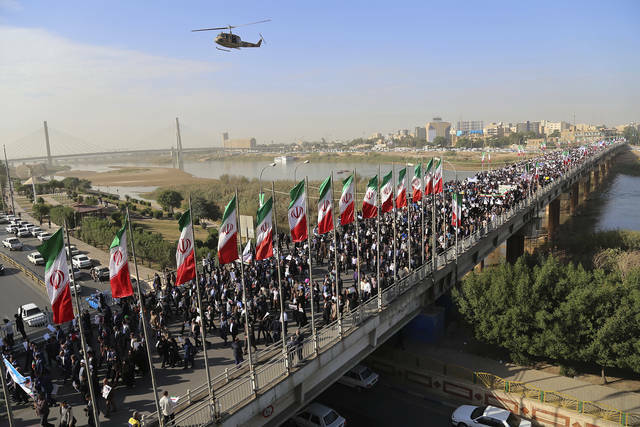 TEHRAN, Iran (AP) — Tens of thousands of government supporters took to the streets across Iran on Wednesday as authorities tried to project a sense of stability after a week of nationwide protests sparked deadly clashes and calls for the downfall of the Islamic Republic. But even as state television broadcast swooping helicopter shots showing support among Iran’s 80 million people for its clerically overseen government, videos emerged showing the anti-government unrest that has swept major cities has also spread to the countryside. The violence has killed at least 21 people and seen hundreds more arrested by authorities. Demonstrators’ videos corresponded with Associated Press reporting from outside of Iran, though individual activists remain unreachable and the protests for now appear leaderless. It was not clear if new protests were held Wednesday or if the videos showed earlier incidents. The past week’s protests have been the largest since the disputed 2009 presidential election, which ended in bloodshed. While many Iranians denounce the violence that has accompanied some demonstrations, they echo the protesters’ frustration over the weak economy and official corruption. The government “should not punish the guilty and the innocent alike,” said Mohammad Hossein Vakili, a 20-year-old computer science student in Tehran who has struggled to find meaningful work and who joined in peaceful protests. “Why should they arrest someone like me when I protest the rise of the price of eggs?” he said. The protests began Dec. 28 in Mashhad, Iran’s second-largest city and a bastion for hard-liners, initially focusing on Iran’s flagging economy and rising food prices. Now, they’ve morphed into demands for wholesale change in Iran’s theocratic government. 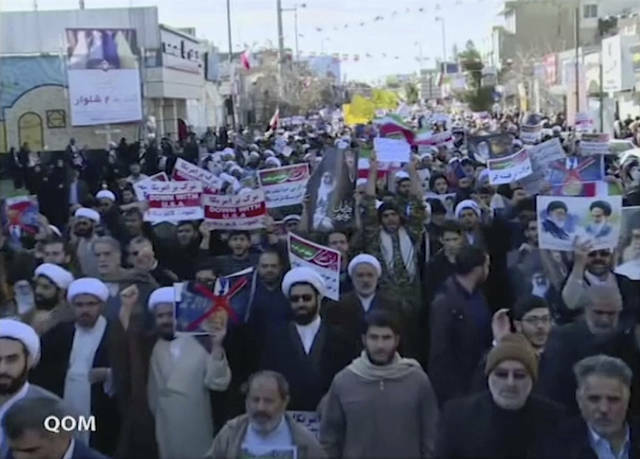 On Wednesday, state TV reported pro-government demonstrations in dozens of cities and towns, including Ahvaz, the capital of the oil-rich province of Khuzestan, the Kurdish town of Kermanshah in the country’s west and Qom, the religious capital of Shiite Islam in Iran. All those cities have seen protests in recent days. 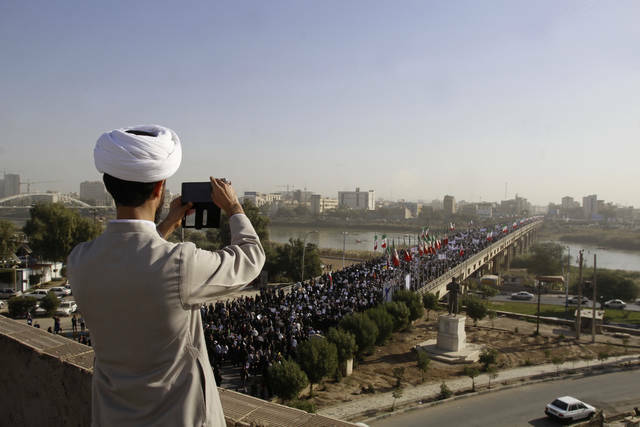 The pro-government crowds included women wearing the all-encompassing black chador, the occasional man in military fatigues and Shiite clerics wearing black turbans identifying them as descendants of the Prophet Muhammad. Some claimed online that government employees had been instructed to take part, something Iranian media did not discuss. Some demonstrators also held aloft pictures of U.S. President Donald Trump with a bright red “X” through his face. Trump has tweeted several times over the last few days in support of the anti-government protests, comments that have angered many Iranians given his travel ban barring them from getting U.S. visas, as well as his comments over the nuclear deal. The 2015 agreement, in which Iran curbed its nuclear activities in exchange for the lifting of some international sanctions, remains popular in Iran, but one of the central grievances of the protesters is that average Iranians have seen few benefits from it. “The Iranian authorities must respect the rights of all demonstrators and detainees, including their right to life, and guarantee their safety and security,” Zeid Ra’ad al-Hussein said in a statement. Iranian officials have downplayed the strength of the protests. Turkish officials on Wednesday said Iran’s President Hassan Rouhani told his Turkish counterpart during a phone call that he hopes the protests “will end in a couple of days.” Rouhani’s office did not mention the comment. It remains difficult for journalists to piece together what’s happening beyond the capital, especially as the government has blocked both the photo-sharing app Instagram and the messaging app Telegram, which protesters have used to organize their demonstrations and share footage. But online videos that emerged Wednesday appeared to show continued protests in the provinces. One showed protesters in Shahinshar, 315 kilometers (200 miles) south of Tehran, throwing objects at a base of the Basij, a volunteer force affiliated with the paramilitary Guard. A gunshot and muzzle flash could be seen in the footage taken in Isfahan province, where there have been days of protests. Another series of videos showed protesters in the city of Noor Abad, some 360 kilometers (225 miles) southwest of Tehran, offering a glimpse into how demonstrations can turn violent. In the footage, protesters are seen tearing down a poster bearing the image of Khamenei and his late predecessor, Ayatollah Ruhollah Khomeini, who led the 1979 Islamic Revolution. After a cut, demonstrators are seen coming to the aid of another protester, who appears seriously wounded. Activists said the man died, though the AP had no way to verify that. In anger, the protesters set fire to an overturned ambulance, shouting as the flames rose into the night sky.